That front wheel looks great, and when you get the matching 10” rear wheel w/280 tire, it’s going to transform the entire look of your 9, especially when the side bags are removed. Chopped off the tail to install license plate bracket with mounts to tuck the turn signals in tight to the plate. Thanks to punkbober for his fab skills! Used Amazon license plate bolts/LEDs to mount the plate to the bracket. Great job. Ontario plates are HUGE. That looks nice, tight, and very clean Bro. FC, i think the angle I took the pic at makes the plate look even bigger than it is...I was looking at the pic again and you're right, it does look HUGE! lol! It's only 4x7 though. I'm not sure how big or small other provinces/territories make their plates. Finally got around to installing the European badges I got from that guy in Holland. 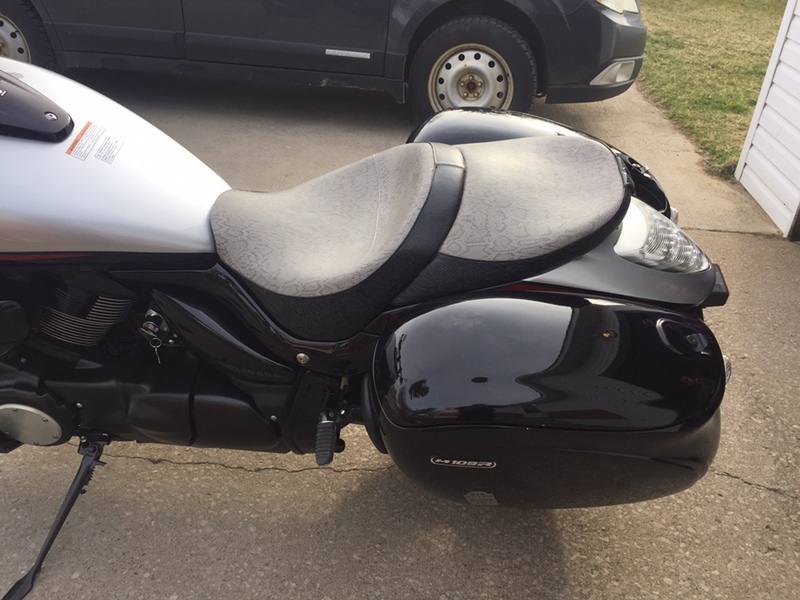 My bike is no longer a Boulevard M109R. It's now an INTRUDER M1800R. Like it is everywhere except the U.S.
We'll figure out a way to fix it for good. It can only be one of 2 things. Either the rubber we discussed, or the round one that goes through the triple three. Yeah, I sure did. Still want to thank you again for getting them for me. That was unexpected. I sure like the way they look compared to the old boulevard labels. I know I could've left them off once everything was cleaned, but I like the look of the badges. It's never stopped me from getting a bunch of every time I ride it. Or people just staring at it. Not bad for a 13 year old motorcycle. The other day when I was filling the tank, the guy at the station said it was the cleanest bike he'd seen all day, and he said he'd seen a lot of them. I did similar things to my BMW - made a bunch of physical and coding changes to make it more like the Euro version. Then I find out all the Euro guys are trying to make *their* BMWs more like North American ones. Lol. True story. Anyway - props to cbxer. "I get it." Put the Sumo 6 degree tree, fat forks, and Yana Shiki risers on today. Ran out of time to button everything back up. Will finish that tomorrow, gonna put on the front LED turn signals and 23" wheel tomorrow as well. Making forward progress finally. I feel like all Ive been doing is tearing down the bike and ordering parts for a few months. Feels good to start putting things back together. My wife and I ride around a lot together so I installed a rear backrest and luggage rack. Next, I installed a nice set of Suzuki OEM engine guards. I had hoped to install a set of Kuryakyn passenger floorboards as well but they were sassing some hardware that I'm waiting for. I ordered the +3 lines and cables today. I ran them behind the triple when doing my 2” risers last week, but I wasn’t feeling it at all. It looked funny to me, the brake line seemed really strained even with the t floating, and the throttle and brake line rubbed on my speedo housing and tank at full turn. I know people do this successfully, And I followed the video by big joe....just didn’t work for me. I just had it repainted before last riding season. I was so pissed. One of those moments just before it happened, the little voice in my head that I ignored. And that just calls Murphy to come and remind you to "listen to the voice in your head"
$600 down the drain. At least now I only have to have the blue part painted on the one side this time and then clear coat. 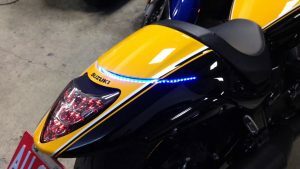 I am debating if I should also get the rear fender one too. would that be overkill you think?